After the hay is cut, it dries in the field. The hay dump rake gathers the dry hay. As the wheels rotate forward, the rake lifts up and dumps the load of hay into rows called "windrows". The rake can be raised for travel to and from the field. This kind of rake was invented in the 1870s and is pulled by horses. It replaced hand raking and was replaced by gasoline powered tractors in the 1930s. The hay is cut in the field and allowed to dry in the sun for a few days. It must then be gathered into rows, called windrows, to allow for easier loading onto a wagon. The cutting used to be done with a scythe and then gathering with a hand rake. The coming of the mower in the 1850s brought with it a demand for a suitable rake. 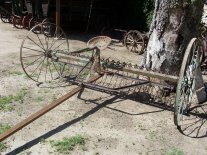 In the 1870s the dump rake that gathered the dry hay from the swath and deposited into a windrow. Later, a power-lift device was included so that a simple trip lever could be used to raise the teeth using the power of the wheels. This was replaced in the 1940's with a combined raking and baling machine. Our Hay Rake has a handle to the right of the seat which raises the rake for travel to and from the field. The pedal under the seat pushed bars which causes the rake to engage the ratchet in the hub of the wheels. As the wheels rotate forward the rake lifts up and dumps the load, creating a windrow.